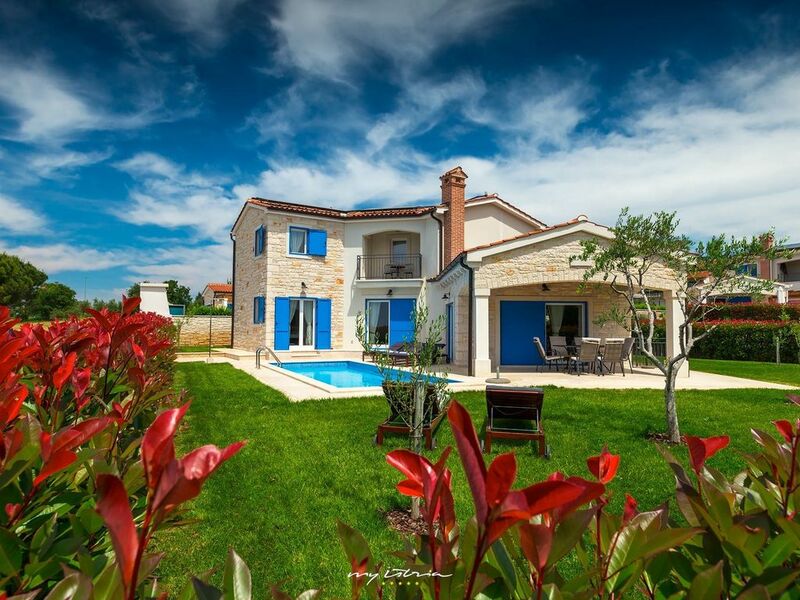 This beautiful holiday home is located in the village of Tar-Vabriga near Poreč. Just 2.5 km from the beach, it features a great sea view. It has been beautifully built and decorated. Outside you will find a private pool, a covered dining area, and a stone built barbecue. Downstairs, there is a nice, light and open living area. All of the 3 bedrooms have en-suite bathrooms. The villa is air-conditioned and it has wifi internet. Shops and restaurants are within short walking distance - just a few meters from the house. Bathroom towels, soap and toilette paper is provided. Great villa- walking distance to shops and a few restaurants. Beautiful Porec and the sea are easy to reach, as well. The villa was very clean and as on the photos. Would definitely recommend! Top Villen in zentraler Lage.Es fehlt wirklich an nichts.Auch die Küchenausstattung perfekt.Leider keine 5 Sterne weil die Straße in der Hauptsaison schon störend wirken kann wen jemand 100% Ruhe haben möchte. Vielen lieben Dank für Ihre Bewertung. Der Vorteil dieser Villa ist, dass diese sehr zentral in der Ortschaft Tar gelegen ist. Fußläufig sind Restaurants und Geschäfte so wie der Strand erreichbar. Durch deren zentrale Lage ist diese Villa nicht abgeschieden, was sie atraktiv macht, wenn man alles vor der Haustür haben möchte. Es freut uns, dass Sie sonst eine schöne Zeit in der Villa Torre II verbracht haben. Ihr My Istria Team. This beautiful holiday home is located in the village of Tar-Vabriga near Poreč. Just 2.5 km from the beach it features a nice sea view. Tar-Vabriga offers cultural and touristic events (e.g. donkey race). While staying in our villas near Porec (9 km) don't miss to visit the Euphrasian Basilica. It was built in the middle of the 6th century in the Byzantine style and it's considered to be one of most beautiful works of art in the world. Poreč is a town with a rich cultural heritage where a massive city wall defies time and greets visitors from all over the world.